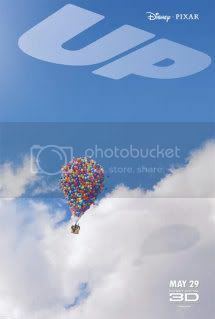 I was lucky enough to win tickets from MommyNiri.com to a sneak preview screening of the newest Disney-Pixar film, Up. Up is set to hit theaters May 29, and will be Pixar's first foray into the 3D world. The preview we saw was in 2D, but after seeing it normal, I definitely will be paying to see this movie come wide release to experience it in 3D. But lots of people are wondering how the movie was, so here's my mini-review without spoiling too much. To give you a quick summary of the plot, an old man balloon salesman named Carl Fredricksen decides to fulfill a lifelong dream of exploration and flies his house to South America with thousands of balloons floating him in the sky. Along with a funny stowaway companion, a little Wilderness Explorer (like the Boy Scouts) named Russell, they encounter the wilds and beauty of the South American jungle. The movie, like all Pixar films, is gorgeous to look at. Besides seeing it in 3D, definitely check it out on a digital screen so you get the crystal-clear imagery (and a definite Blu-Ray purchase down the line). And as usual, the musical score is whimsical and fun, setting the tone throughout the film. Now maybe it was because I was running on 4 hours of sleep, but I got a little verkemplt a few times (count: 3) in the movie. Bring some tissues to dab off those 3D glasses, because there are some very touching and sad scenes. I joked afterwards that it was sort of like a CGI version of The Bucket List (which I never saw, but I'm assuming). But if you cried during that scene in Toy Story 2 where we learn about Jessie the Cowgirl and her owner growing up and leaving her under the bed, or any time little Wall-E's heart was broken, I think you'll get a little choked up in this movie. But don't get me wrong, it's not all tears. Carl and Russell make a hilarious odd couple, and they make a few friends along the way. Carl is voiced by Ed Asner, who is one of the industry's greats. Carl may be old, but he's hardly like the Grumpy Old Men. The character is adorably created in CGI, and really spot on, especially with his so-reminiscent-of-the-true-elderly walker. A friend of mine told me this was inspired by the Venezuelan rainforest (canaima). Do they ever mention anything like that? Just curious. I don't recall. There is a term they use of where he is trying to fly the house to, but it's slipping my mind. Paradise Falls maybe? Woohoo! So excited to see this!